Alex Granato scored a weekend double, beating two former FEI World Cup champions to win the $208,200 Longines FEI Jumping World Cup Wellington at the CP Palm Beach Masters Winter Classic CSI4*-W presented by Suncast at Deeridge Farms on Sunday, Feb. 3. 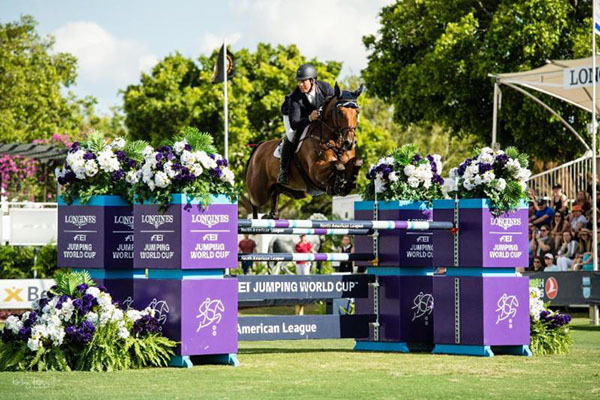 Riding Carlchen W, Granato also won the FEI $71,200 Suncast Palm Beach Masters World Cup Qualifier on Friday, Feb. 1. The jump-off read like a who’s-who of international show jumping with Olympic veterans and FEI World Cup champions among the nine who jumped in the second round on the Alan Wade-designed course. Conor Swail, was the pathfinder in both rounds and rode the first clear in the jump-off in a time of 44.68 seconds on GK Coco Chanel, which resulted in fourth place. Granato and Carlchen W shaved off nearly two seconds with a time of 42.70 to take the lead with a slew of stars yet to jump. Olympic veteran Mario Deslauriers, the 1984 FEI World Cup winner, and Bardolina came close with a jump-off clear round time of 43.48 for second place. The crowd held its breath as the last to go was 2007 FEI World Cup champion and Olympic veteran Beat Mändli, who raced around the course on Dsarie and was on track to take the win, but missed with 44.16 seconds for third place. Granato will long remember his time at Deeridge Farms. This is the fourth year for the Palm Beach Masters at Deeridge Farms, and if the riders have any say, the series will continue for a long time. There were several special presentations awarded on Sunday. As Sunday’s winner, the Hunter Harrison Award was presented to Page Tredennick, owner of Carlchen W. Tredennick also won the Sue Grange Award on Friday, as the owner of the winning horse of the FEI $71,200 Suncast Palm Beach Masters World Cup Qualifier. Other awards presented were the “Doc Spirit” award, named for Dr. John R. Steele, which was presented by Charlie Jacobs to Dsarie, owned by Grant Road Partners and ridden by Beat Mändli. The award is presented annually to the horse that best exemplifies the heart and athleticism necessary to be competitive at the highest level of show jumping. The Michael Meller Style Award went to Darragh Kenny of Ireland. Also on Sunday, Katie Dinan rode Ulpi N De Brekka to victory in the $10,000 Turkish Airlines Gold Championship Grand Prix, topping a 10-horse jump-off to win in a time of 34.772 seconds. Andy Kocher was second on La Luciole, going clear in 34.787, and Flo Norris was third on Songe De Toscane, going clear in 35.276 seconds. The Palm Beach Masters Series hosts top international equestrian competitors from across the U.S. and abroad. Beginning with one elite competition in 2016, the series has grown into one of the sport’s most prestigious events. The show grounds are located at the spectacular Deeridge Farms in Wellington. Award-winning landscaping surrounds the custom-built show grounds and the facilities that host the series, which include two masterfully created competition arenas — a Grand Prix turf arena and an all-weather sand arena. Additionally, there are two Bermuda grass schooling arenas, one designated for FEI and another for non-FEI competitors, along with an all-weather schooling arena adjacent to the competition arena and another located near the stables. The picturesque location, unrivaled hospitality, custom-built jumping rings and world-class facilities guarantee a one-of-a-kind experience for riders and spectators alike.